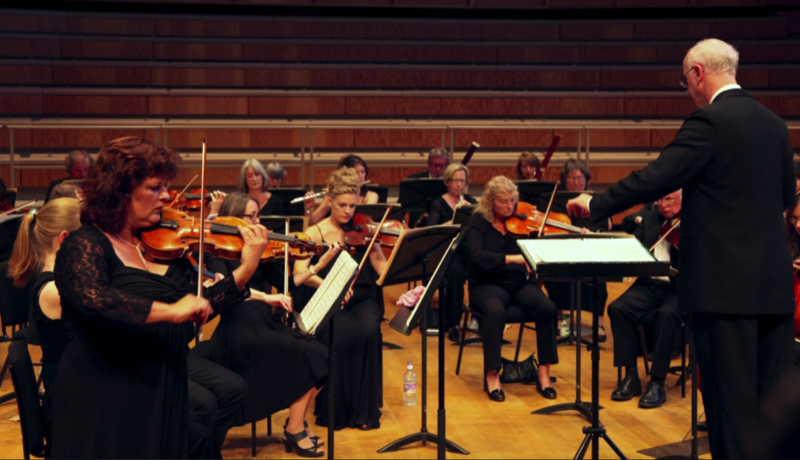 The Canterbury Orchestra’s 29th November concert (held in the luxurious setting of the University of Kent’s Colyer-Fergusson Hall) took as its premise the infamous love triangle of the three composers on show: Johannes Brahms, Robert Schumann, and Clara Wieck (to give this prodigiously gifted musician her maiden name). Yet what emerged was not, as might be expected, a passionate ménage a trois; instead we were introduced to the less-heard Schumann, and reminded of her devotion to her husband throughout his long and disfiguring illness. Opening the concert was Brahms’ Tragic Overture, a work written some 26 years after the death of Robert Schumann. Like much of Brahms’ orchestral oeuvre, it is a work full of dynamic ebb and flow, which the Orchestra attacked with some enthusiasm. Particular mention here should go to the brass, whose tone was never less than powerful when it mattered; however they were also capable of moments of great sensitivity, trombones dovetailing wonderfully at one point with the woodwind before being answered by a pair of gently lilting solo phrases from the French horn of Irena Rieband. The next pair of pieces were an opportunity for us to hear the beguiling work of Clara Schumann, played wonderfully by the evening’s soloist, Katherine Tinker. In a superb piece of programming, Clara’s Variations on a Theme of Robert Schumann (a work for solo piano) was presented before her Konzertsatz. Written for her husband two years before his death in a Bonn asylum, the Variations came as a startling and welcome change after the orchestral pomposity of the Overture. Taking a theme from his Bunte Blatter, Op. 99, Clara weaves a series of ever-beguiling arabesques around the 24-measure melody. Yet despite the increasingly baroque character of these variations, the theme acts as a still centre of the work – ever present and in fact recurring in its plain, unaltered form numerous times. Tinker’s voicing and touch was never short of commendable throughout. The Konzertsatz in F minor was never completed by Clara Schumann, though a version (premiered 1986) exists today as completed by Jozef de Beenhouwer. It is not, sadly, a successful completion; although the opening is as bewitching as anything that the Variations have to offer, what grace and charm there is soon becomes stifled in ungainly and uninspired orchestration. The smaller size of the Orchestra’s string section gave their performance something of a ‘chamber’ quality – as if the work had been composed for the salon, rather than the concert hall, and was unexpectedly and charmingly fitting. There was much success in performance here, the orchestra oscillating in and out of focus and providing an understated, controlled background to Tinker’s mesmeric arpeggios. You can only make the best of a bad job – but the players did well to maintain interest throughout. The second half of the concert was given over to the earliest work, Robert Schumann’s ‘Rhenish’ Symphony. Here the contrast with the Konzertsatz was plain – from the opening offbeat chords the orchestra seemed to be relishing the richness of Schumann’s orchestral textures, sculpting the dynamic swells of the opening movement with great power and care. Once again we were reminded of the quality of the Canterbury Orchestra’s horns, but here too the strings came to the fore, seemingly involved in every gesture but always without tiring or losing intensity. Great sensitivity and control of dynamic contrast was evident in the second movement too – at the end of this Scherzo the players built to a suitably rowdy crescendo before showing great restraint in bringing the movement to a delicate close. The third movement was equally touching, ending with wonderfully light interplay between first and second violins, but a special mention should go to the bassoons, low strings, and trombones, whose firmness contributed hugely to the orchestra’s powerful tone both here and in the fourth movement. By now the players and conductor Andrew Lowen seemed to be delighting in their command of the material, and a suitable victory lap was offered by the breezy fifth movement. Not that there was any lack of control here: at one point a lengthy orchestral crescendo was handled with the utmost care and finished with a flourish; not a bad way to end at all.